Section of the Macksville Centennial Book dealing with buildings and Main Street. Macksville History Committee and The Lewis Press, “25- Buildings and Main Street,” Digital Macksville, accessed April 22, 2019, https://macksville.digitalsckls.info/item/27. Main Street - Note the street lights known as the Great White Way. These lights were later put in the park and are still in use there. East side of Main Street after 1916. West side of Main Street after the fire in 1911. South building is the old F & M Bank. Main Street after a rain. Main Street Saturday afternoon 1931. From left to right: Verlan Biggs, Clarence Goudy. West side of street Roy Miller driving Chevy in middle of street. Winfred DeGarmo and Lowell Blood. Headers sold by Wiley Hardware Co., Macksville, Kansas. 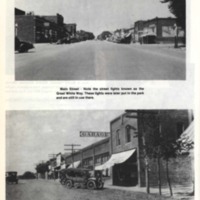 Main Street Macksville, Kansas, Feb. 17,1923. Main Street early days looking north. North Main Street early 1900’s. side of Main Street but Joe Demain Drug Store. down. Laying brick at the intersections on Main Street. Laying new Main Street in 1975. C.H. Hoover Clothing Store and W.S. Fred and Son Grocery. Broadway Super Service built by Al Abrahamson in 1926. Later in 1931 was K.T. Oil Co. Charles Fitzsimmons was the owner. Located on corner of Highway 50 and Main. Taken down in late 1985. Hotel Belt being moved in from Cassady in 1903. New Hotel built in 1908. About four o’clock last Sunday morning the inhabitants of our little city were awakend by the cry of fire, and they soon learned that the Cook Hotel was on fire. Unless much work was done the entire west side of the street was destined to burn. When the fire was discovered it had made such headway that it was useless to try to fight it and, in fact, many of the occupants of the rooms barely escaped with their lives. Some did not save any luggage. All that Mr. Cook saved from the hotel was a small amount of office furniture. They were fortunate, however, in having a few of their belongings in a small house at the rear of the hotel, which did not burn. We understand insurance was carried to the amount of nearly $3,000. This will be quite an aid, but the loss of the building and contents far exceed that amount. The origin of the fire is a mystery which may never be solved as no one saw it until it was making rapid headway in the roof. The citizens of the town, realizing that the building could not be saved, turned their attention to saving the south side of the street. A bucket brigade was formed at the Lill Building, occupied by the Searl’s drug store, was kept soaked with water. Men were on top and at the side of each building and in that way the embers were cooled. The building burned slowly and the wind was not very high. Had the fire occurred a few hours later, the wind would have skipped in across the street so that it would have been impossible to fight to any advantage. The loss of this hotel will work quite a hardship to Macksville and the traveling public, as it has conducted and enjoyed a very liberal patronage. Being the only hostelry in town, it will be missed very much. We hope Mr. Cook will see his way clear to soon begin the erection of a larger and better hotel. And, if not so, the businessmen of the city should unite and erect a first class hotel and opera house combined. Let’s have a hotel of which all of Macksville can be proud and now is time to make the move. Wolf’s Blacksmith and General Repair Shop. The Demain-Powell Pharmacy built in 1908. Campbell Theatre Building built in 1912. Wiley’s Furniture, Hardware and Funeral Parlor before the fire in 1911. Hi Way 50 Cafe built in early 50’s. Corner Pharmacy in the Demain Building 1911 - 1915. Heimiller Greenhouse on Highway 50. Culley and Reeds Hardware and Furniture early 1900’s. Livery Barn. Joe Demain in street where Walker Bros. is in 1985. Modern service station 1919 where A & S Repair is now. Conoco Service addition added in 1976. 1986 Apco Station. Brown Oil Co. Highway 50 and Main, Sept. 1973 after 11 inches of rain. Employees of the store were: John and Ida Lynch, Guy Malin, Mayme Tony (Campbell), Janie Starke. Tudor-Morgan closed the store in 1947. The Tudor-Morgan Store is the direct descendant of one of the first stores in Macksville, that of Jay Pinney, J.H. Tudor of St. John purchased the store of Mr. Pinney April 3rd, 1901, W.C. Bean becoming the manager. When Mr. Bean left Macksville to enter the business in Spear-ville, Mont Hilleary became manager of the Tudor Merc. Co. Mr. Hilleary was followed by Fred W. Tudor, son of J.H. In September 1917 J.R. Morgan bought a half interest in the business and J.A. Lynch came over from St. John to take the managership of the store. This store always enjoyed a large trade and years ago, it was not uncommon for farmers to make it their headquarters when in town for the day. They might purchase some cheese and crackers and sit around the fire to eat them. Elmore Ford Garage. Left Herbert Odom. Gem Pharmacy - owned by Barney Ezra Searls. Sold to Demain and Powell in 1909. Mr. Searls is on the left of picture. This building Is the Livery Stable where Ed Walker is now. Before it was remodeled. Right: English Grain built in 1956. Left: Farmers Co-op Assoc. in 1961. Bunge Elevator was built in 1961 for Farmers Co-op. They sold it in March 1972 to Bunge Corp. It can store 250,000 bushel of grain. English Grain was built in 1955 and the addition added in 1956. It can store 807,000 bushel of grain. It is owned by Bob and Bill English at St. John.